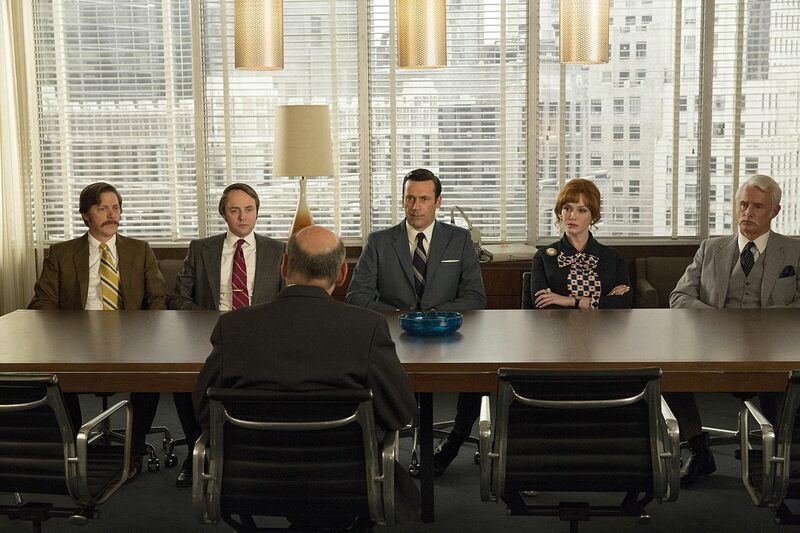 In the Season 3 finale “Shut the Door, Have a Seat,” Sterling Cooper’s major players are saved from being acquired by McCann Erickson by Don’s idea to have Lane Pryce sever their contracts and to secretly start their own agency. In this week’s episode “Time & Life,” directed by the actor (Jared Harris) who played Lane Pryce himself, Don, Roger and company reach for one more trick up their sleeve, but come up as empty as their two floors of the Time-Life Building soon will be. “What’s in a name?” Don asks toward the end of an episode. For Sterling Cooper, a lot. As the partners say goodbye to each other at the bar, they are not only saying goodbye to the name of of their agency, but to the company itself that has kept them together through the years, despite their personal feelings toward each other at the time. It’s an agency that has continued to find ways to survive, often against all odds (“We’ve done this before, you know we can,” says Don). It averted the sale by Putnam Powell and Lowe to McCann in 1963. It stuck it out through the loss of Lucky Strike in 1965. It mucked through a messy merger in 1968 in time to make itself attractive enough to be bought by McCann as an independent subsidiary in 1969. “Boldness is always rewarded,” Roger tells Ken, and for SC, it often has been. But Don and his colleagues long ago sold their souls to the company store, and this week they find themselves absorbed by the agency they for so long were determined to stay away from. The song playing in the background while Peggy tells Stan she gave birth to a child is “Stranger On the Shore” by Acker Bilk. The song was also played during the Season 2 finale “Mediations In An Emergency,” which was the episode where Peggy informed Pete that she had given birth to their child. The feud alluded to by the headmaster at the private school Pete and Trudy visit appears to be the Campbell-MacDonald feud of Scottish fame, specifically the massacre at Glencoe in 1692. The massacre took place in Glen Coe, in the Highlands of Scotland. Interestingly, “Coe” is the name by which Ken refers to Pete in this short story he wrote in Season 5. Peggy instructs the children to “do what you would do if we weren’t watching.” It’s reminiscent of when she and the other secretaries were secretly monitored “playing” with lipstick during Season 1, when Peggy’s behavior lead to her being put on the Belle Joilie lipstick account and launched her copywriting career. Jim Hobart looks at Don when he tells him they will now be servicing the account of Coca-Cola. 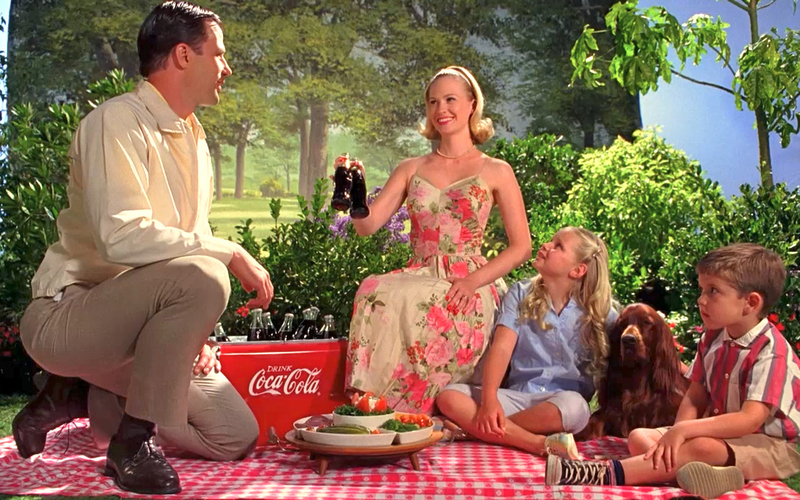 During the Season 1 episode “Shoot,” Hobart uses Betty as a model in Coca-Cola ads in attempt to persuade Don to leave Sterling Cooper for McCann. It symbolizes that McCann has finally acquired Don after a 10-year pursuit. As the partners drink at the bar, a Heinz ketchup bottle sits on the table – a symbol of much smaller battle they also fell short in pursuit of. It was Lane Pryce himself who punches out Pete during their conference room boxing match during Season 5’s “Signal 30”, so it was only right here to see an episode directed by the actor who played Lane include a scene where Pete settles a dispute with a punch to the face. “Greenwich, Connecticut is built on divorce money!” – The latest in a litany of great one-liners from Peter Dyckman Campbell. Previous Previous post: Dylan & Draper: Will Don Paint His Masterpiece?